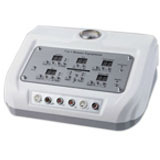 the beauty instrument has Ultrasonic, HF (high frequency) electropathy, Emaculation, Breast care, Vacuum and Spray functions. Each function has a separated switch, easy and simple to handle. Overcome the defect of traditional multifunctional instrument that with one function break down, all the others could not be used. The machine is with generous, elegant and portable design . - With 2 Probes, the big one is for body nursing,and the small one is for eyes care. Cleanse skin,make skin fresh,it would be a refreshin experience to use together with perfume or essential oils . Vacuum suction goes deep into the skin,clearing up the deep dirt,grease and other impurities,removing acne.